This question was asked on the PostgreSQL novice newsgroup recently and Tom Lane fielded the question. Its a common thing to want to know if you are using the new 8.3 Enum feature. So we felt it useful to restate it. Question: Given an enum, is there a query you can run to list out all the elements allowed by the enum? Problem You are developing a consultant search application where by a user looking for a consultant can check all the items in the list they require a consultant to have. You have 2 tables. consultant and consultant_qual. The consultant_qual has primary key formed by 2 fields consultant_id and qual_id. qual_id contains a constrained list with things like 'OpenLayers', 'PostGIS', 'Python', 'C#' etc. How do you devise a query that given a list of checked options by the user, only returns consultants with not 1 but all of those qualifications? When looking at a problem like this, I am always amazed at the number of ways you can solve this in SQL. Some very convoluted and slow, some very convoluted looking and fast, and some pretty fast and pretty simple. How can that be when SQL is a declarative language? It all boils down to what angle you look at the problem or rather how you restate the problem and also the fact that like in other languages there are a myriad of ways to say the same thing and some databases and dataset patterns do better with one than another. The divide and conquer approach: Treat this as an n step repeating problem and only solutions that are solutions to each step will be the solutions to the final problem. The lets just do this in one gulp approach: The number of checked options by the user must equal the number of qualifications that a consultant satisfies that are in the list of checked options by the user. The nice thing about the gulp solutions is that regardless of what the user checks, your query is more or less the same and always has the same number of sub queries. There are lots of permutations we can think of here too, but these are just 3 to demonstrate. I was reading Josh Berkus last blog post and was intrigued by his last post Writing Maintainable Queries Part I. He is right that lots has been said about coding standards in other languages and even right out holy wars have been launched on the subject, but as far as SQL goes, not quite enough has been said on the subject for us to have a great war to end all wars. I was also happy to see that we agreed with all his points except his first one. Yes I felt dissed, and thought hmm if someone as important as Josh thinks our aliases should be very descriptive and we should use the table name rather than the alias where possible, surely there must be something wrong with me for not believing in this fundamental philosophy. In the rest of this excerpt I shall make fun of Josh and also set forth some of our own SQL Coding guidelines. Hopefully Josh won't take too much offense at this small jibe. Getting back to Josh. Imagine a world filled with Josh Berkus wannabies taking his advice to its logical conclusion and what you get is this. I found a great cartoon depicting this somewhere, but don't seem to find this at the moment. Indenting, uppercasing SQL keywords, and using AS are the most important conventions we try to hold to. Of course this is no offense to Josh - just a little nit-pick. Kind of reminds me of working on PostGIS, and one day to my disbelief I discovered the philosophies of 2 people I have great respect for look like this. and of course all I could think -- What barbarians! How could I even share the same planet with these people? When all is said and done, probably the most important thing when working on a team, is that everyone grudgingly agrees to follow the same sane standard and the code created done by 20 programmers looks like it was done by the same person. Both Josh Berkus and Hubert made blog entries about our last excerpt. In general I will start off by saying that we are more or less in agreement on what is good SQL coding format. Should you use aliases over tables and if you use aliases should you keep them short or more descriptive. Josh thinks table names should be used where possible and when aliases are used they should be longer than a few characters and Hubert agrees with us that short aliases are fine and in fact desirable. I think we all agree aliases should be meaningful when used, but our idea of what it means to be meaningful is a little different. In use of JOIN syntax -- we prefer using INNER JOIN instead of using just JOIN and in fact find it quite irritating that PostgreSQL rewrites our INNERs as JOIN. I suspect Hubert and Josh and many other PostgreSQL folk are on the other side of the fence on this. The reason we feel strongly about this is there are so many kinds of JOINS - INNER JOIN, RIGHT JOIN, LEFT JOIN, CROSS JOIN, FULL JOIN, and the horrid NATURAL JOIN (that should be shot and put out of its misery). To just say JOIN to us is just confusing. So let us start by looking at Josh's last SQL statement and compare to how we would write it. Josh I hope you didn't come up with this table structure. We personally hate the use of id as a field identifier for every table, but that's another story. We prefer something like forum_id, post_id etc. and whats the deal with giving a field name of date. Stay away from data types as field names. -- Leo tends to prefer upper case alias for table lower case or proper case for fields. -- I couldn't demonstrate this without messing up the format of the page. -- whether she upper cases or lower cases or proper cases. -- because Leo believes every programmer should have at least 36 inches to work with. I will start off by saying for the above example -- Josh is lucky because his table names are naturally short and we are disadvantaged in this example because two tables start with the same letter. Imagine if the table names were much more descriptive how repetitive and noisy Josh's scene would become. The reason we prefer short aliases over long is that it allows you to fit more fields on the same line and scan them quickly and still prefix with the table names. Leo prefers upper case his table because he can quickly spot where a table name ends and field begins. Generally speaking you usually have 4 tables or fewer in a statement, the FROM clause is not that far away as a legend, and the tables usually start with different letters, so its not a large mind cramp for us to remember F is for Forum and C is for Comments. Unlike other languages, you then need to keep on repeating this variable over and over again which is much more typing as well as just makes your statement that much longer to digest. As a last gripe to what Josh said. Just because you have 255 characters at your disposal as opposed to the 8 you once had, doesn't mean you should feel compelled to use them all. Long live Fortran. It is older than any language I can think of including COBOL and has stood the test of time and is still undergoing innovation. We have mentioned time and time again, one of the great selling points of PostgreSQL is that it has so many languages to choose from for writing database stored functions and the code you write in those stored functions is almost exactly the same as what you would write when writing in that language's environment. The reason for that is that PostgreSQL applies a thin layer around the environment the language lives in, so your code is really running in that environment. The down-side of this approach is you must have that environment installed on the server. This is a bit different from the Microsoft SQL Server model where code you write in VB.NET, C#, IronPython etc. gets translated into Common Runtime Logic (CLR) so your code is not really running in the environment it would normally breathe in and if you have dependencies you have to enable them in the SQL Server GAC which is different from the Server's .NET GAC. In this section we shall introduce PL/Python - which is a PL language handler for Python that allows you to write PostgreSQL stored functions in Python. First of all I should start off by saying that we are not proficient Python programmer's so if anyone sees anything wrong with what we say feel free to embarass us. We are also taking this opportunity to test-drive PostgreSQL 8.4 on both Linux (OpenSUSE) and Windows, using the EnterpriseDB PostgreSQL 8.4 beta that Dave Page recently announced on his blog. This install is great if you are running Windows, MacOSX or Linux Desktop, but sadly does not have PostGIS as part of the stack builder option. For pure Linux Server CentOS/Redhat EL/Fedora no desktop installs or if you just feel more comfortable at the command-line, PostgreSQL Yum repository generously maintained by Devrim is the one to go for. We haven't tested this one out, but I presume the steps are pretty much what we outlined in Using PostgreSQL Yum repository. Some things to watch out for which may not be entirely obvious if Linux is new to you. Before you can run the Linux .bin installs, you must make them executable by either chmod 777 thebinfile or in explorer GUI right-click and mark as executable. Windows users can skip this step. If you are running another PostgreSQL on your box, give this a different port when the wizard asks, say 5434 or 5433. One thing I find very intriguing about the language Python is that it seems that every hot shot GIS programmer programs in it and prefers it to any other language. In fact it is almost a tautology, If you don't program in Python, you must not be a hot shot GIS programmer, though you could be a hot shot Spatial Database Programmer. I haven't used Python enough to figure out what these people see in this language, but there must be a reason for its strong following particularly in the GIS industry. Even ESRI applications install Python which seems kind of odd to me if you look at the strong .NET/Servlet infrastructure underneath the ESRI architecture. Their programmers must have been throwing severe temper tantrums for ESRI to allow this to happen. Can I use PL/Python under PostgreSQL Windows? Yes. Though in general Python is not preinstalled so you must install it. Install Python 2.5 by getting from http://www.python.org/download/releases/ or using Linux distro. It must be Python 2.5 since that is what the PostgreSQL 8.4 beta builds are compiled against. As of this writing Python 2.5.4 is the latest of the 2.5 series. Of Course. What PostgreSQL thing can you not use under Unix? Mac OSX. In fact a lot of Linux installs have Python already loaded so your life is surprisingly easy here. However if you get a message when installing it that it couldn't be loaded most likely you do not have Python 2.5 installed or it can not be found. PLPython is an untrusted language which means you can do dangerous things with it if you want and you should be more careful about what accounts you allow to write these functions. Now we shall test drive PL/Python with a new feature introduced in 8.4 called default parameters. As a side note, in an unrelated article entitled Chocolate and Peanut Butter Cross-Breeding with PostgreSQL, SQL Server 2008, and Oracle on our BostonGIS site, we griped a little bit about how PostgreSQL has no default parameters like Oracle does and alas in 8.4 it has it and better yet you can even use it in Python. In the first part of this series Fusion Charts and PostgreSQL Part 1: Database Analysis of USDA DB in our November/December 2008 issue, we did some back-seat analysis of a database we had never seen before and formulated some thoughts of things that would be useful to see in a dashboard as well as starting to develop some views to support our Dashboard. In this part, we start the fun off by building an ASP.NET app in both VB and C#. In the next part of this series, we shall perform the same feat with PHP. A drop downlist that allows the user to pick the metric to explore -- e.g. Cholestrol, Vitamin K, Caffeine etc. 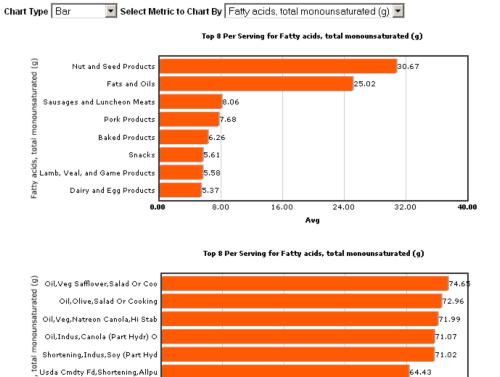 You can see the app in action - USDA Food Stats and discover some interesting things about the food you eat or were considering eating. Dim outputTag As String = "</chart>"
Dim topn As String = "8"
Case "FCF_Column3D", "FCF_Doughnut2D", "FCF_Pie3D", "FCF_Bar2D"
Me.DropDownListAttribute.SelectedItem.Text & "' yAxisName='Avg' >"
strXML = strXML & "<set name='" & Server.HtmlEncode(dr("item_name").ToString().Replace("&", " ")) & "' value='" & dr("tot").ToString() & "' />"
strXML = "<chart isSliced='1' slicingDistance='4' decimalPrecision='2' subcaption='Top " + topn + " By "
In the first part of this series Fusion Charts and PostgreSQL Part 1: Database Analysis of USDA DB in our November/December 2008 issue, we did some back-seat analysis of a database we had never seen before and formulated some thoughts of things that would be useful to see in a dashboard as well as starting to develop some views to support our Dashboard. In the second part of our Fusion Charts series, we covered creating a Dashboard application in ASP.NET that demonstrated both VB.NET and C# variants using the database we loaded and prepped in Part 1. In this part three of our series, we shall conclude by demonstrating the same application we did in ASP.NET in PHP. A drop-down list that allows the user to pick the metric to explore -- e.g. Cholestrol, Vitamin K, Caffeine etc. Long aside: Paragon forcing their twisted philosophies on poor unsuspecting readers. You can ignore this if you want, unless you wish to be enlightened :). It allows you to easily cater to different devices and produce numerous output layouts without making your basic logic difficult to understand. Think for example if you have a report aht rquires you ca output in wordml, open office xmla nd html format that needs to confirm to an extremely defined design spec. It is just so much easier to do it with a template than try to generate different variants with standard PHP syntax. When those designers give you their vision of what a page is supposed to look like, its easier to integrate their vision into the overall architecture without screwing up your vision of how the logic should flow. Display concerns lend themselves to a different style of programming than what you would expect directly from a business flow tier. It keeps your sanity if these two styles aren't swashed together. templates - this will be where our .tpl file resides. Create another folder called FusionCharts on root of webfolder and put the FusionCharts flash and .js files there. $str_xml = "<chart isSliced='1' slicingDistance='4' decimalPrecision='2' subcaption='Top $topn  By "
$str_xml = "<graph showNames='1'  decimalPrecision='2'  formatNumberScale='0' rotateNames='1' caption='Top " . $topn . " Per Serving for " . FROM   " . $aview_name . " WHERE metric = COALESCE(" . $this->db->qstr($att_value) . ", 'Unknown') " . This is a product that has nothing to do with PostgreSQL yet, so it does seem kind of odd that we are listing this in our product showcase section. 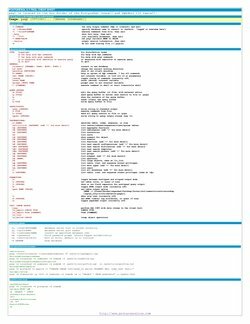 Well it is not even really a product per se, but I was just so enamored by the beauty of the layout and the usefulness of these cheat sheets, that I felt it was worthy of being listed in our showcase section since some of these would be useful to the PostgreSQL community of programmers. What is this product you ask? It is DZone RefCardz. When I discovered this array of cheat sheets, I became a glutton and downloaded about 10 of them. It made me even want to start learning Ruby and also made me realize how little I know about CSS. I was disappointed to find out that while they have an Essential MySQL, which by the way is extremely useful, they don't also have an Essential PostgreSQL yet. Someone should really write one of these things for PostgreSQL, but I guess it would be best for that someone to be a published author since it seems the main focus of RefCardz is as a publicity card for an author's book. As a side note, it did get me thinking about the format of Postgres OnLine Journal cheat sheets and as many people have mentioned, perhaps we do try to cram too much information on one page. The layout of RefCardz cheat sheets seems to provide a good balance between amount of content and brevity and made me realize that having a multi-page cheat sheet is not such a bad thing. Their choice of colors, layout and diagrams is just mesmerizing. PSQL is the command line administration/query tool for PostgreSQL. It is simple, light-weight and packed with a lot of charm. Unfortunately we can't quite capture all its charm in a single pager cheat sheet, but hopefully this will give you a sense of its usefulness. Below is a Thumbnail view of the PSQL cheat sheet. This is by no means comprehensive, but are the features we use most often. It is also pretty much what you get from the help screen with just some added color. PDF Portrait version 8.5 x 11" of this cheatsheet is available at PSQL8.3 Cheatsheet 8.5 x 11 and also available in PDF A4 format and HTML.